GitHub - dieterich-lab/circtools: circtools: a modular, python-based framework for circRNA-related tools that unifies several functionalities in a single, command line driven software. circtools: a modular, python-based framework for circRNA-related tools that unifies several functionalities in a single, command line driven software. Want to be notified of new releases in dieterich-lab/circtools? We developed circtools, a modular, Python3-based framework for circRNA-related tools that unifies several functionalities in single command line driven software. The command line follows the circtools subcommand standard that is employed in samtools or bedtools. Currently, circtools includes modules for detecting and reconstructing circRNAs, a quick check of circRNA mapping results, RBP enrichment screenings, circRNA primer design, statistical testing, and an exon usage module. Click here to access the complete documentation on Read the Docs. Installation is managed through python3 setup.py install. No sudo access is required if the installation is executed with --user which will install the package in a user-writeable folder. The binaries should be installed to /home/$user/.local/bin/ in case of Debian-based systems. 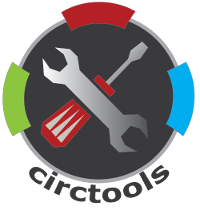 circtools was developed and tested on Debian Jessie but should also run with any distribution. The installation procedure will automatically install two dependencies: DCC and FUCHS. The primer-design module as well as the exon analysis and circRNA testing module require a working installation of R with BioConductor. All R packages required are automatically installed during the setup. Please see the "Installing circtools" chapter of the main circtools documentation for more detailed installation instructions. The detect command is an interface to DCC, also developed at the Dieterich Lab. The module allows to detect circRNAs from RNA sequencing data. The module is the foundation of all other steps for the circtools work flow. All parameters supplied to circtools will be directly passed to DCC. The quickcheck module of circtools is an easy way to check the results of a DCC run for problems and to quickly assess the number of circRNAs in a given experiment. The module needs the mapping log files produced by STAR as well as the directory with the DCC results. The module than generates a series of figures in PDF format to assess the results. The reconstruct command is an interface to FUCHS. FUCHS is employing DCC-generated data to reconstruct circRNA structures. All parameters supplied to circtools will be directly passed to FUCHS. The circtest command is an interface to CircTest. The module a a very convenient way to employ statistical testing to circRNA candidates generated with DCC without having to write an R script for each new experiment. For detailed information on the implementation itself take a look at the CircTest documentation. In essence, the module allows dynamic grouping of the columns (samples) in the DCC data. The exon module of circtools employs the ballgown R package to combine data generated with DCC and circtest with ballgown-compatible stringtie output or cufflinks output converted via tablemaker in order get deeper insights into differential exon usage within circRNA candidates. The enrichment module may be used to identify circRNAs enriched for specific RNA binding proteins (RBP) based on DCC-identified circRNAs and processed eCLIP data. For K526 and HepG2 cell lines plenty of this data is available through the ENCODE project. The primer command is used to design and visualize primers required for follow up wet lab experiments to verify circRNA candidates.